Physical therapy tools - Whether you need balance boards to improve coordination or hot and cold therapy supplies to relieve aches, pains and tension, 3B Scientific has the answer for any ailment. Find physical therapy tools specially designed for electrotherapy, physiotherapy, ergotherapy, compression therapy, resistive therapy and more rehabilitative equipment for a wide range of physical therapy treatments. Physical therapy treatment tables - Find the therapy equipment physical therapy practitioners turn to at the most affordable prices at 3B. Choose from exceptionally strong portable treatment tables that are dependable and ideal for students, the office or practitioners who make house calls, tilt tables for adjustments and traction tables that offer dozens of brilliant features! Massage therapy supplies - Treat your patients and clients on-site or in the privacy of their own homes with portable or stationary massage tables from Adapta, plus massagers and treatment room accessories including face cradles, head rests, stools, and privacy screens. For spa use you'll find aromatic spa therapy supplies, massage oils, paraffin baths, chakra stone therapy treatments, therma-wraps and more relaxing physical therapy treatments! Physical therapy tools while you sleep - Continue to work on your physical therapy while catching up on your zzz's with physical therapy tools that help you enjoy instant stress relief and decompression while you're sleeping! Give your head and neck a break with memory foam pillows, gravity pillows, wedges, bolsters and other premier therapy pillows that will help you breathe easy and prepare your body for a brand new day! 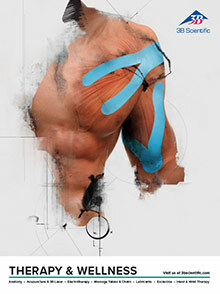 For physical therapy supplies, massage equipment, and items to improve your patient's or client's overall quality of life, 3B Scientific not only brings you the highest quality physical therapy products, they bring you the 3B Scientific's with every purchase - Best quality, Best value and Best service.